The bIO-PRO Raman Probe delivers optimal performance with each Raman analyzer in the RAMANRXN SYSTEMS™ suite. Utilizing a state-of-the-art design, this probe features a fixed-focus approach which provides for long-term measurement stability while also delivering a high signal-to-background measurement at any length of optical fiber. It is this novel design which allows the probe a 12mm OD, IP-65 rating, and suitability for SIP/CIP applications common to bioprocessing. The design of these probes, complete with their industry standard 120mm length and right angle connectors, make them ideally suited for side port applications in traditional stainless steel as well as bag lined stainless steel bioreactors/fermenters. Additionally, their Pg 13.5 threading enables their use with industry standard housings for Standard, Safety, Sanitary, and NA Connect ports alike. 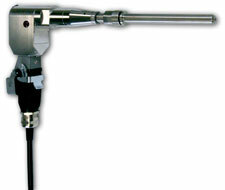 All bIO-PRO Raman probes utilize a single fiber for excitation and another for collection. For applications in pilot and manufacturing, this provides a robust interface and sampling versatility while reducing fiber cost over long runs. Single collection fibers also permit simultaneous multi-channel operation on a single analyzer. Standard fiber cable length is 5 meters, however cable runs of up to 400 meters are feasible options.